Syracuse hosted the seventh International Building Physics Conference (IBPC2018) in September, gathering experts on the engineering, science and design of buildings from 33 countries. At the forefront of the three-day event was Jianshun “Jensen” Zhang, professor of mechanical and aerospace engineering in the College of Engineering and Computer Science. 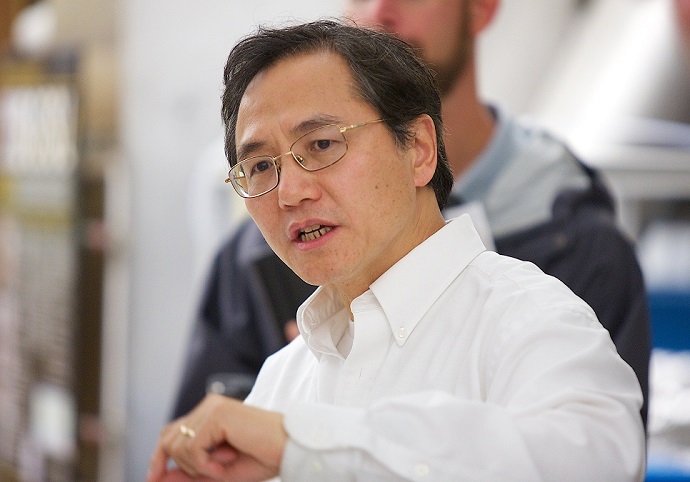 Zhang was recently named the chairman of the board of the International Association of Building Physics, after being confirmed by members during the conference. IBPC2018 was organized by the Syracuse Center of Excellence (CoE), the College of Engineering and Computer Science and the School of Architecture. Zhang points out the unique role of the CoE, which fosters collaboration among many disciplines at the University. The conference drew more than 350 scientists, engineers, architects and Ph.D. students. The course drew 20 students from the U.S., Canada and Europe. It included a forum and workshop on the CHAMPS (Combined Heat, Air, Moisture and Pollutant Simulations) software platform, which is a 15-year collaboration between the three countries along with the University of La Rochelle, France; the University of Tokyo, Japan; and Tsinghua University and Nanjing University, China. CHAMPS is used by researchers, engineers and architects. Three major themes stand out for Zhang when reflecting on the entire conference. First was its breadth. Presentations and demonstrations ranged from the material level, nanoscale, to the room scale, to the building environment to urban scale, Zhang said. Second was the high quality of the presentations. “I was very impressed with the technical presentations,” Zhang says. “There was very good technical depth.” Third was the integration of different disciplines in exploring all aspects of buildings.